﻿ Warren G. Harding Memorial - Ohio. Find It Here. On Oct. 11, 1923, shortly after President Hardings death in August, the newly formed Harding Memorial Association started a nationwide fund-raising campaign to fund construction of a memorial.Over a million contributors from all parts of the United States and the Philippines, as well as several European countries, contributed the sum of $977,821. 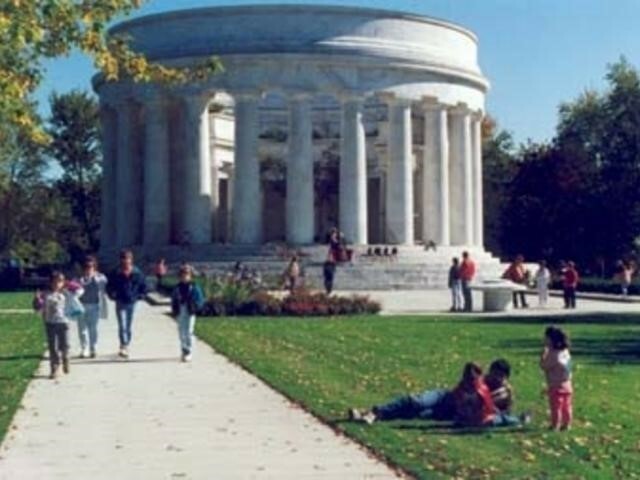 Included in the list of contributors were about 200,000 schoolchildren who gathered pennies for the fund-raising effort.While funds were being raised, the association also had to decide whether the memorial would be built in Washington, D.C., or in Marion. Many national leaders wanted the President buried in the nations capital. The memorial association, though, strongly felt that Harding would have preferred Marion as his final resting place.Following President Hardings death on Aug. 2, 1923, and his subsequent funeral, his body was placed in the Receiving Vault in Marion Cemetery until the memorial was completed. Florence died in 1924, and her body also was placed in the vault. The Hardings bodies were moved to the memorial and buried there in December 1927. President Herbert Hoover officially dedicated the memorial in 1931.